TMJ is the acronym for temporomandibular joint, which connects your lower jaw (the mandible) to your skull at the temporal bone. This joint controls many jaw functions, like chewing. If the chewing muscles or the joint itself are causing you pain you, may have temporamandibular disorder, or TMD. TMD can be caused by stress, continual clenching of the jaw muscles, or teeth grinding. 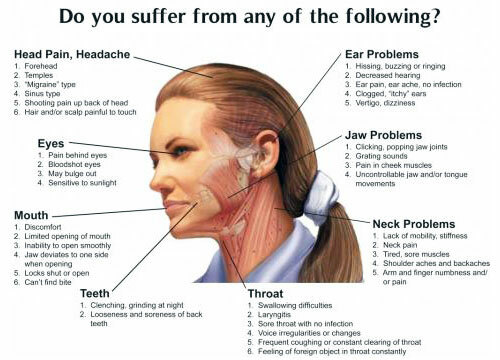 If you suspect you may have TMD, come in for a consultation. We can help diagnose you and provide relief for your symptoms. Pain relievers and hot/cold compresses are short term methods to provide relief for pain symptoms. A night guard can be used to help prevent or lessen the effects of teeth grinding at night. This can lead to a more permanent solution. In very severe cases of TMD, surgery may be required, but behavioral treatments to change the way you use your jaw muscles are usually enough to provide relief.